The winners of the SongDoor 2012 International Songwriting Competition have been announced: the Grand Award has gone to Debra Gussin and Rik Howard, of Los Angeles, CA for their song, "Is That You?," which also won the Christian category. Jan. 24, 2013 - PRLog -- The winners of the SongDoor 2012 International Songwriting Competition have been announced: the Grand Award has gone to Debra Gussin and Rik Howard, of Los Angeles, CA for their song, "Is That You?," which also won the Christian category. Entries were received from 19 countries on four continents. 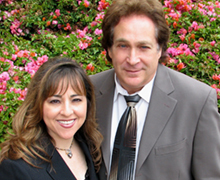 “Debra was a finalist in two categories (Christian and Soft Rock) and won them both,” says SongDoor president Tony Zotta. “She also had two Honorable Mentions. Debra is a force to be reckoned with in the songwriting world. Whatever the secret is, she has discovered it." "I'm just beyond thrilled and honored with everything. For someone who is supposed to be good with words, I'm really speechless," says Gussin, a former producer for the Dr. Phil show as well as the Daytime Emmy Awards, Wolfgang Puck, Fox Sports News and ABC’s Wide World of Sports. A chance meeting with Marty Panzer, Barry Manilow's long-time producer, led her to win the Concord Records & Barry Manilow Songwriting Scholarship — four times — and gave her the confidence she needed to leave the world of TV producing and begin songwriting full-time. Debra is the lyricist on "Is That You?". The melodies were written by Rik Howard, a long-time jingle writer (Nissan, Avon, Miller Beer, Three Musketeers and Coca-Cola) as well as the themes for TV shows like Silver Spoons, Punky Brewster, You, Again? and Second Chance. Rik and his show band perform regularly in the LA area. Jamie Nattier was second in the Grand Award race, winning the Country category with his song, "Love Grows Wild Out Here." Judge Bill Shore (who has written hits for Garth Brooks, George Strait, Sawyer Brown and many others) described it as "lyrically very strong, with a positive message and a good feel." Nattier says the song is just an expression of his life and surroundings, which are literally a large corn and soybean farm in southern Illinois. All of the winning songs may be heard online at http://www.songdoor.com. The competition was generously sponsored by SongU.com, Broadjam, 16 Ton Studios, MasterWriter, Songsinc, Herringbone Recording Studio and Hard Twist Music/BMI. Not just the winners won — every songwriter who entered this year's competition receives a free 45-day all-access trial to SongU.com, as well as free key-transposing software to help them improve their skills. As winner of this year's Grand Award, Gussin and Howard win a single-song publishing contract, a one-year Platinum membership to SongU.com, a full-band demo cut at a high-profile studio on Nashville's Music Row, Masterwriter software, a Songsinc membership, Masterwriter software and a host of other prizes valued at more than $7,900. For more about this year's SongDoor winner, visit http://www.songdoor.com, and http://debragussin.com and http://rikhowardmusic.com. SongDoor 2013 is open for submissions on April 15, 2013. The entry fee is $10. For more information, visit http://www.songdoor.com. SongDoor is an annual event designed by songwriters, for songwriters. The competition is open to amateur and professional songwriters worldwide. Judges include seasoned music industry producers, artists and engineers who have worked with/for such artists as Britney Spears, 'NSYNC, Neil Young, Lynrd Skynrd, Jimmy Buffett, Garth Brooks, Keith Urban and many, many others. All entrants receive approximately $120 in free songwriting tools, regardless of whether or not they win anything.